Wondering what to prepare for evening snack? Try cabbage pakoda today! Cabbage is known for its good health benefits and particularly for weight loss. It reduces constipation as it has good amount of fiber. In earlier recipe on cabbage salad we have explained good benefit of cabbage. “Cabbage is one of the fibrous and nutrient rich vegetable. Cabbage can vary in color from green to red and purple, and the leaves can be smooth or crinkled. With less than 20 calories per half cup cooked, it is a vegetable worth making room on your plate for. It is a very good source of manganese, dietary fiber, potassium, vitamin B1, folate and copper. Additionally, it also a good source of phosphorus, vitamin B2, magnesium, calcium, selenium, iron, pantothenic acid, protein and niacin. 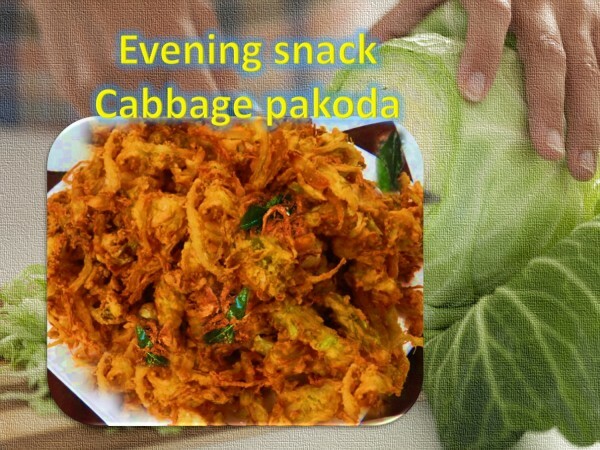 Cabbage pakoda is a good evening snack and good item for parties. Frying cabbage pakoda takes little extra time than regular onion or vegetable pakoda. But it is worth trying. To flor mix add chopped green chillis, cabbage, ginger, chilli powder, asafetida, cilantro, cumin and continue mixing well. To hot oil, slowly release a spoonful of cabbage besan mix. Fry the pakoda -Keep turning pakoda till it cooks & turns golden brown color. Transfer pakoda to a paper towel to remove excess oil. Serve hot pakoda with chutney or tomato sauce and hot coffee / tea!